I went to bed early (for me) last night but slept in until almost 8 AM. It was cool in the coach and I had cats snuggled up with me enjoying the warmth of the electric heating pad. When I finally got up I tended to their needs—food, water, and litter—and then tended to mine; fruit juice, granola, coffee, and grapefruit. It is Tuesday, which is trash collection day, so I gathered up the trash from the kitchen and took it to the refuse container by the curb. We will only have one more trash collection while we are here and that will likely occur after we have pulled out on Tuesday March 3rd. I finished up yesterday’s blog post, got dressed, and got to work on my bus projects. I started by wiping off the spotting on the windows and body from the recent rains. I thought the reason I spent 40 hours cleaning and waxing the body was so water would run off if it but apparently I was mistaken. I had also noticed that the wax on the passenger side of the bus had not been fully rubbed down. I started working on this but without using additional water it just made it look worse so I quit somewhat disgusted with the whole situation and got to work on other stuff. First up was the dashboard instrument lighting. For the turbo boost gauge I made a 5 inch extension lead with red #14 wire and insulated female spade connectors on each end to connect to the +24VDC supply wire for the old gauge. I made a similar lead with black wire for the ground but only put a connector on one end to attach to the new gauge bulb holder. I used a crimp style speed connector to splice the free end into the existing ground wire which had a fork connector on the end that I did not want to cut off. I put one of the 24VDC wedge base bulbs in the holder and snapped it into the gauge. I undid the retaining ring on the speedometer and pulled the instrument out the front of the dashboard. I thought I had wired the two light bulbs in series to use 12VDC bulbs on a 24VDC circuit but discovered that they were already wired in parallel. I pulled the two bulb holders out and the bulbs were discolored as if they had been too hot. I could not determine the voltage rating on the bulbs so I replaced them with 24V ones. I reinstalled the speedo into the dashboard and put the dashboard cover back on. I will test the lights the next time I connect the chassis batteries. I next considered replacing the MAC valve that controls the air shutters for the two A-C compressor/condenser units in front. I looked at the existing valve and decided to hold off until I could talk to Butch. He and Fonda had taken off for the day, so that would have to wait. The valve has a diagram on it that indicates how it operates but I was not completely clear on how to read it. When I built the new air panel I used identical replacement valves and plumbed them the same as the old ones. I searched online for “pneumatic valve symbols” and got all kinds of sites. One of them had a 25 slide presentation on ANSI standard symbols and schematics so I downloaded and studied it. With my new knowledge I was able to verify that the valve was, in fact, installed correctly. I figured it was since it seemed to work correctly (until it failed) but it was nice to know for sure. I am not certain that the three control switches are wired correctly, however, but that is a different project for a different day. I really did not want to change the entire valve. I bought the replacement valve from Hei/Tek in Phoenix so I called them for technical support. They confirmed what Butch suspected; the operator (solenoid) can be changed without replacing the entire valve. They had a defective valve and offered to take the solenoid off and mail it to me for no charge. Deal. I should have it tomorrow so I deferred any further work on this project until the part arrives. By now it was time for lunch so I made a nice sandwich with toasted sourdough bread, vegan deli slices, Daiya havarti style vegan cheese with jalapeños, lettuce, onions, pickles, veganaise, and honey mustard. Next up was mounting the turbo boost sensor. It was a beautiful, sunny day but rather cool so I put on one of my long-sleeve flannel work shirts. Hey, who said the desert in the winter was paradise? Oh yeah, I did. I knew this was going to be an annoying little project and it was. The turbo boost (intake manifold pressure) sensor is a small rectangular part about 1″ wide by 2″ long by 1/2″ thick. It has a weatherproof 3-wire electrical connector and a 1/2″ long tube that the pressure hose from the intake manifold slips over. The sensor is mounted to a somewhat larger flat bracket with a slight bend in it. The bracket has an angled slot and is supposed to be secured to the back side (towards the front of the bus) of the engine computer mounting bracket by a single bolt that the slot slips over. No doubt there is an easy (correct) way to mount the bracket, but it probably requires disassembling other stuff to create access. That was not going to happen, at least not today. One problem was that there was not a lot of space to get my hands in there to work. Another problem was that I was working “blind.” Even though I had a telescoping mirror I could not position it correctly in the available space and I needed both hands to install the bracket. But the real problem was that the retaining bolt had long ago disappeared and I had no idea what bolt was supposed to be used or if it threaded into a hole or required a nut. I had looked this up in my engine manual some time ago so I knew where and how the bracket was supposed to mount, but the manual did not call out the diameter, thread pitch, or length of the mounting bolt. I tried several bolts that I had but none of them where right. I asked Barb to keep an eye on my tools and bus while I made a quick run to Herb’s Hardware where I bought an assortment of bolts. None of them fit. One of my original bolts was “close” but a little loose. I decided to wrap it generously with Teflon tape to see if I could fatten it up enough to hold. I reattached the electrical harness, shortened the pressure hose, and reattached it as I would not be able to make these connections after the bracket was mounted. I finally managed to get the bracket installed and I think my taped bolt will hold it until we get home and I can figure out the correct bolt. Even if/when I do, there is no good way to get in there and tighten it. I ended up using a 7/16″ short socket with a swivel adapter and 6″ long drive extension that I turned by hand. At least it was mid-late afternoon on a beautiful day with abundant sunshine illuminating the west-facing engine bay. I still have a half dozen projects to take care off over the next four days but it was good to have the dashboard and turbo boost sensor completed. During the course of the afternoon I discussed with Barb and Jim what I had found about the use of potassium bromide (KBr) to control seizures in dogs and cats. I really hope they will discuss this with their vet. I made popcorn for a late afternoon snack and then checked my e-mail to see if Stacy had proofread my Quartzsite 2015 article and deal with any other correspondence from publisher Gary Hatt. She had called in sick again, so the proofreading was delayed yet another day. Linda had called while driving home but caught me in the middle of working on the turbo boost sensor mounting. I called her back around 6:30 PM my time (8:30 PM EST). She was really tired so we did not talk very long. At 7:30 PM (MST) I called David Lambert. David currently lives in a group home in Olympia, Washington (PST). He has long been the adult best friend of J.C. Armbruster, my best friend from high school (besides Linda, of course). I met David on a visit to Washington State many, many years ago and we also became friends. I learned then that David had struggled with bi-polar affective disorder all of his life and it has not gotten better for him with time. He does not have much contact with people outside of the group home other than J.C., who has really come to his rescue over the last couple of years. David does not usually have much to say, but I try to let him know that I know he exists. Tonight, however, he was a bit more talkative and told me about recent visits with his sister Mary Kay from Everitt, Washington and his half-sister Soliel, who is moving to Sacramento, California. He also like to watch the TV program “Axe Men.” He is at least a 3rd generation native northwesterner and logging is part of his family heritage. For dinner I heated up the “Soyrizo” we bought at Albertson’s supermarket. I diced garlic, shallot, sweet onion, carrot, green and jalapeño peppers and sautéed them is a little olive oil before adding the soy Chorizo and heating it thoroughly on high heat. It was a filling but tasty dish. After dinner I resumed working on the photos of Larry and Carol Hall’s GM bus conversion. By the time I got to bed and turned the lights out it was midnight. I was up at 7:30 AM, which seems to be my norm when I’m in bed by midnight. The local Farmers Market operates on Wednesdays and this would be my last opportunity to buy a loaf of Barry’s Basic Bread. I skipped coffee and breakfast, got dressed, and counted out enough dimes and nickels from the cup where we store our change to cover the $3 cost of a loaf. Once I got back to the coach I made coffee and had breakfast and then settled in to finish yesterday’s blog post, which needed a lot of work, and start on today’s post. Jasper sat on my lap purring and enjoying my attention for quite a long time before moving to the dinette. Juniper ate breakfast and then stretched out on the passenger seat as she does most mornings. The cockpit is the part of the bus that gets coldest at night but since we are parked facing east it is the first place to warm up in the morning. The sun is not coming up due east yet, of course; that doesn’t happen until March 21st, but it is rising more directly in front than it did in late December and much of January. I still had a list of bus projects to work on, but first I checked my e-mail. I did not have a communique from Stacy or Gary so I logged in to our WordPress website/blog and replied to a comment Kate had recently posted. While I was logged in I updated three plug-ins, deleted 80 spam comments, and initiated a Wordfence scan. I repeated the update process for the FMCA Freethinker and Great Lakes Converted Coaches websites and the South Lyon Area Amateur Radio Club website. “In for dime, in for a dollar,” and “no time like the present” are phrases that came to mind. Replacing the solenoid operator on the air-conditioning shutters. Replacing the solenoid on the pilot valve that controls the level low front axle. Securing the wheel well body panel just forward of the PS drive axle. Starting the generator and making sure it works by turning on all three A-C units + Starting the bus and making sure everything works, including repositioning the bus and re-leveling it to make sure the Level Low system is working. I was going to have to slide under the bus in order to reach some of the screws. Given that reality, I slid one of my stands under the chassis just aft of the passenger side rag axle. The chassis was about 1″ above the stand but I was reasonably confident it would keep the bus from falling on me if the passenger side air springs failed suddenly. I also pulled out one of my large sheets of plastic that make it a lot easier and more comfortable to slide under the bus, especially on gravel. I had removed and replaced the two splash guards at Butch and Fonda’s house this past fall when we replaced the ride height linkages. Fonda helped me with that project so we both knew how obnoxious a job it was even with the bus sitting on four chassis stands so I could get under it easily and work safely and comfortably. But there was no way around it, so the splash panel came off. We put the body panel back in place but had trouble lining it up with the holes in the chassis. Where the front top corner attached we could see that an old fastener had rusted into the hole and sheared off, probably when someone tried to remove it. Someone showed up to talk the Butch and Fonda about their work-camping job for next winter so I continued working alone. I eventually got the panel secured at all six points plus the bolt and got a nut on the bolt. I also got the splash guard back in place with the three retaining screws installed. The fourth mounting point, however, used a bolt with a spacer tube and a locknut and was in a location that made it impossible to install by myself without getting completely under the bus and sitting up by the transmission or pulling both drive wheels off, neither of which was going to happen. That meant I needed Fonda’s assistance again. I started putting my tools away and cleaning up my worksite while I waited for Butch and Fonda’s visitor to leave. He eventually did and Fonda came over to help me with the last attachment point on the slash guard. Once that was done, again with some difficulty, I put my tool boxes away and locked up the bays and the car. It took a whole afternoon for what started out as a job to replace one missing screw. That’s often how it goes with buses. I washed up (buses can be dirty work) and then worked on this post for a while. I called Linda a little after 5:45 PM my time (MST) figuring she would be close to being done working for the day. I figured correctly and we talked for about 15 minutes. The issue with the generator required a new pressure regulator and some new hoses. Natural gas operates at 1/2 to 1/3 the pressure of propane and, even though the generator engine is supposed to work on either just by changing an electrical connection, Bratcher Electric said they have seen this delayed failure quite a few times when switching from propane to natural gas. It is still programmed to self-test on Thursdays at 11AM EST, so we will see if it auto-starts tomorrow like it should. For dinner I made a mixed greens salad with onion, carrot, green pepper, dried cranberries, honey roasted peanuts, Daiya pepper jack vegan cheese, and Tofurkey brand deli slices cut into thin strips, dressed with Newman’s Own Creamy Balsamic dressing, and a couple of grinds of fresh black pepper. I was starting to run low on the lightly flavored/carbonated water that I enjoy and we were almost out of raisins which I use on my salads. I was also out of hummus and Snyder’s Sourdough Pretzel Nibblers both of which are unacceptable things to be without. I had checked the Road Runner Market here in town a couple of days ago but they did not have any of these products. Our supply of small paper bowls and plates was also getting low. The forty mile round trip to Albertson’s in Blythe, California would take 75 to 90 minutes and two gallons of gasoline, costing $5 to $6, but I decided to make the trip after sunset rather than work at my computer. The left side of my neck and left upper back were bothering me more than usual as a result both of long hours at the computer and working under the bus on the body panel today. As long as I was at the store I picked up a few things that were not on my list including: Ken’s Steak House salad dressings, several different fruit preserves, another bottle of honey mustard (with real honey), another pack of Tofurkey peppered mock deli slices, some black grapes, extra chips, and two bottles of Goslings Ginger Beer. It was an easy run over and back, a nice drive over the small mountain range that separates this part of Arizona from California. We have not driven around much at night since we have been in the southwest and I discovered that both Blythe and Quartzsite sparkle like gems at night. On the drive from Blythe back to Q I could easily see all the way to the other side of the valley once I was clear of the pass. Not only were the lights of the city spread out before me, I-10 was a ribbon of white and red light snaking up the KOFA Mountains until it disappeared over the next pass. It was quite a sight. Back at the coach I got all of the groceries moved from the car to the kitchen and put away. The plastic bags often end up with holes in the bottom because they are so thin so I sorted them according to whether they had holes or not and ended up with five of each. How convenient. I put one holy bag inside each unholy bag creating five ready-to-use double bags. Sometimes I amaze myself. But I can only bask in the glory of my accomplishments for so long and then I have to get back to the processes of daily life. Tonight that meant cleaning up the dishes from dinner and checking e-mail. I lose track of time when I am working and it was well after midnight by the time I turned off the lights. For some reason I was awake at 7 AM. I can function on only six hours sleep but I do better on seven. By eight hours I am uncomfortable and need to get up whether I am rested or not. Even before I got up I heard engine noses and voices outside and looked to see what was going on. It took me a moment to recognize Larry and Sandy’s motorhome and then remember that they were taking it to Yuma for a long weekend. Larry had told me yesterday they were going to do that so they would be in a good position to watch an air show at Marine Corps Air Station Yuma. It has been getting cool overnight, dropping into the upper 40’s, so I put on my sweat pants and shirt. We bought these not long after we got to Quartzsite so we would have something easy and comfortable to wear on mornings when it was cool in the coach. I fed the cats, refreshed their water, cleaned their litter tray, bundled up the trash, ground up some Sweet Seattle Dreams coffee beans, and brewed a pot of coffee. I got out the two blue blankets and put one on the dinette seat and one on the passenger seat. Jasper immediately curled up on the dinette blanket and Juniper curled up on my lap while I sat on the coach working on my blog posts for yesterday and today and enjoyed my first cup of coffee. I like the start of the day; it is one of my favorite times. I am usually rested and generally relaxed and have the comfort of my small morning routine. The whole day is in front of me and it is still possible to accomplish something, anything really, but not everything, and sometimes not much. The end of the day is always more variable. Replace the solenoid operator on the air-conditioning shutters. Replace the solenoid operator on the pilot valve that controls the level low front axle. Replace one of the driver side headlights (it has a small hole in it). Replace the two auxiliary tail lights in the car. Although I have most of the parts I need I was expecting another solenoid operator for the shutters to arrive in yesterday’s mail. It did not, so I hope it arrives today as I really do not want to replace the whole valve nor do I want to disassemble the new one, even though I’ve been told that it is OK to do so. I think the headlight can wait until I get home, but I need to see if I have one with me. Starting the generator and making sure it works by turning on all three A-C units + some additional load(s). That will also verify that the air-conditioners work. Starting the bus and making sure everything works, including repositioning the bus and re-leveling it to make sure the Level Low system is working. The things that will wait until Monday include checking/setting all of the tire pressures, which I will do on Monday morning, and making sure the hitch and tie bar are ready to go. While I was working on this post I got a call from Joe Cannarozzi, the mobile mechanic who has maintained our bus chassis, generator, and some aspects of our main engine for the last four years. He is still in Mississippi but starting to arrange his spring service calls enroute to his summer job in upstate New York. Unfortunately it looks like he will be in Michigan in early April and we will miss him this time around. By the time I finished breakfast it had warmed up enough in the coach to take a shower. I then started a load of laundry and settled in to upload some blog posts from early January. I decided to keep doing consolidated posts and started pulling together the ones for January 1st through 7th. I selected nine photos from these dates and processed them. My work was frequently interrupted by the three loads of laundry I was doing and some necessary housekeeping. The water level in our fresh water tank was indicating below 1/3rd so I checked it visually. It was at 1/4 so I filled it, which took about 90 gallons. I tested the water coming out of the softener for total hardness (TH) using a test strip from each bottle as I wanted to make sure the strips gave me the same reading. They did, and it was somewhere above 0.0 and below 1.5. As the tank was nearly full I noticed water on the floor of the bay and determined that it was coming from the fresh water tank drain valve. I soaked up the water that was there and tried moving the valve quickly open and then closed to see if that might clear a small piece of debris or somehow “seat” the valve. The leak was not coming out the drain pipe onto the ground. It was seeping around the top of the valve housing but I could not determine if it was coming from a seam or around the metal rod that comes out the top and attaches to the knife blade inside. This is a 1-1/2″ diameter valve of the type used on smaller RV waste tanks, especially grey water tanks. I will check in the morning to see if it leaked overnight and probably make a trip to several of the RV stores here in town to see if I can locate a spare valve. I won’t be able to attempt a repair, however, until the tank is almost empty so I only have to dump (waste) a small amount of softened fresh water. Interspersed with my blog work I had some pretzel nibblers and sun-dried tomato hummus and eventually ate a grapefruit. I did not feel like fixing anything fancier so that constituted lunch. Butch and Fonda left at 1:45 PM to check the P. O. Box and then go to a meeting of the Quartzsite Gem and Mineral Club. They stopped at the post office on the way hone but there was no package for me. Linda called at 2:45 PM my time. She had wrapped up her year-end work at the bakery and was back at the house making a cup of tea before settling in for one more evening of tax return work. She was fairly confident that she would have everything wrapped up tonight or tomorrow morning. There was a tentative plan in place for her to babysit Madeline Friday evening so Brendan and Shawna could go out. Plans were also in the works to attend a women’s gymnastics competition at the University of Michigan on Saturday and then go to dinner. She did not mention whether Meghan would be joining them. Sometime during the afternoon I got the last load of laundry out of the dryer and put away. I took a break from working at my computer around 6 PM to sit and chat with Butch and watch yet another gorgeous Quartzsite sunset. In spite of a cooler air mass the sun was very hot today, but once it started to set the air temperatures asserted their presence and we eventually retreated to our coaches for the evening. I continued working on my blog post, checking e-mails as they popped up. I had one from Gary with my Quartzsite 2015 article attached. Although Stacy had not made it into work she was feeling well enough to edit it at home. I had planned to view a live Technomadia chat on “Making Connections on the Road” at 7 PM but forgot to tune in. I realized my oversight around 7:30 PM and joined the event in progress, but first I had to create an account with the LiveStream service which involved the usual e-mail verification process. But it was quick and I got to see/hear the last 20 minutes of the event which was mostly Q&A. The whole thing was archived, however, so after it ended I nuked a vegan hot dog for dinner and then replayed the part I had missed. I had not yet made the bed so I took care of that and then resumed working on my blog post. I finally uploaded the post sometime around 10:30 PM and by the time I uploaded and captioned the photos, created all of the tags, and clicked the “publish” button it was after midnight. Rather than wait until tomorrow, I went through Stacy’s edits of my article, accepted most of them, and rewrote a couple of awkward sentences. I uploaded it to the BCM folder in my Dropbox and then e-mailed Mike (editor) and Gary (publisher) that it was there along with all of the photos. I also e-mailed it back to Stacy and Gary so she could compare it to the one she sent me. I got to bed at 1:30 AM, later than I like but with some things accomplished. In spite of going to bed so late last night (early this morning, actually) I was up at 7:45 AM. That was mostly because the cats do not care what time I went to bed. They have their routines and by 8 PM they figure breakfast and fresh water are way overdue. Linda called around 9:15 AM my time to ask me about a bucket full of water in the furnace room. The double wall stainless steel flue pipe for the furnace runs horizontally under the floor joists through the furnace room and then through my office above a suspended ceiling and finally out the east side of the house. Moisture tends to condense inside the pipe and drip out of it at the joints between sections if they are not sealed. The bucket is there to catch the drips and it was full. It used to drip on the furnace but Tom from TOMTEK HVAC sealed that gap so now it drips somewhere else. Linda checked the status of the UPS delivery of the “care” package Linda shipped to me. It was in Blythe, California at 5:15 AM this morning and scheduled for delivery by the end of the day. It will be nice to finally have my pillow and once again be able to enjoy Linda’s homemade granola. After breakfast I checked my e-mail, updated my water usage spreadsheet, and finalized my FMCA Freethinkers 2014 financial statements. The statements are now ready for Linda to audit, which will take her all of 10 minutes (at most). I then took stock of my BCM articles that are “in-process” and decided to finish the one on the Turbo Boost Repair and move it to the proofreading stage. With that done, I started pulling together the next consolidated blog post for January 8 – 14, 2015. For lunch I made a sandwich with sourdough bread, salad greens, vegan deli slices, vegan cheese, pickles, veganaise, and honey mustard. The solenoid operator from Hei/Tek in Phoenix was not in today’s mail so something obviously went wrong. I called Hei/Tek and talked to Brie. She checked with her shipping department and called me back to let me know it got sent UPS ground to our P. O. Box. UPS does not deliver to P. O. Boxes so it was sitting in Blythe, California in an undeliverable status. I gave them our P. O. Box number because she told me on Tuesday they were going to mail it (USPS). Brie gave me the number for UPS, but it was a national 800 number. I looked up the local Blythe UPS center but it had the same national number listed. It also indicated their Will Call hours were M – F, 9 – 10 AM. I called the 800 number and Jose fielded my call. He changed the status to “hold for pickup” and we will have to drive to Blythe on Monday to get it. Somewhat ironically I had a UPS delivery scheduled for today and it arrived around 4 PM. My part could have been on the truck had I done something about this on Wednesday or Thursday. The box contained an envelope for Butch and Fonda and a small envelope for me. My envelope contained license plate tabs and registration cards for both vehicles, and dues check for our FMCA Freethinkers Chapter. The box also contained my pillow, which I have missed, and four bags of Linda’s homemade granola, which I have really missed. Since I could not get my part until Monday I decided to take the operator solenoid off of the new valve and put it on the old valve. This was certainly a faster, easier job than replacing the entire old value/operator with the new valve/operator. I put air to the shutters and used the low voltage control circuits to test the new operator solenoid and it worked as designed and built. I settled in at my computer to work on the next consolidated blog post, stringing seven separate posts together and selecting/processing photographs. I worked on a detailed e-mail reply to Gary at BCM and then worked for a while on another article that has been “in-process” since January. I was finally hungry around 9:30 PM and heated up an Amy’s frozen Sweet and Sour gluten free noodle dish. Much to my surprise it was not very good, which is unusual for Amy’s products. I needed to get up and adjust tire pressures first thing in the morning so I made sure I was in bed with the lights off by midnight. I got up at 7 AM and debated whether to go ahead and adjust the tire pressures or make coffee and eat breakfast first. I was a short debate and I won. It was 8 AM by the time I finished my granola and my first cup of coffee. The sun was well above the horizon but partially obscured by clouds and the temperature was 57 degrees F. I put on my zip front work hoodie (sweatshirt jacket) and went out to take care of business. I turned on the TireTraker Monitor and stuck it in my pocket. As I removed each sensor it triggered a brief alarm on the monitor. Most of the bus and car tires were close to correct according to my air pressure gauge, with some slightly over-inflated and some slightly under inflated, except the driver side steer tire on the bus which was four pounds low. When I put a sensor back on the valve stem it reestablished communication with the monitor. This is supposed to trigger a new/current reading on the monitor but it appeared to me that all of the displayed pressure values were off, reading high in most cases by 3 – 4 pounds. I am not convinced yet that this system works the way I was told it does. With the tires taken care of I disconnected the air hose from the air-compressor and stored it in the tray over the driver side drive wheels along with the air pressure gauge and air chuck. I disconnected the power cord and rolled it back up on its reel and then put the air-compressor back in its travel compartment in the car. I then went back inside to have my second cup of coffee. A wind advisory was in effect for today and through the overnight hours. Winds were forecast at 25-30 MPH with gusts over 40 MPH and that is what we got. The temperature barely reached 70 degrees F while the sun played peek-boo with partly cloudy skies all day. The combination made for a brisk day. The forecast for Sunday morning through Tuesday noon is for rain, with possibly an inch along and north of I-10, and a flash flood watch from 5 PM Sunday until 5 PM Monday. February was definitely going out with a roar. I spent the central part of the day cleaning out the front bay of the bus and re-packing it. We acquired a few things while we here, most notably supplies for cleaning and waxing the bus, and they had to be stored someplace for travel. We had kept several cardboard boxes from UPS shipments and I used those to organize the new cleaning supplies and stow them in the back seat of the car. Butch and Fonda put their mats away yesterday and I should have done the same but was busy with other things. Jim L. stopped by to use Joe and Connie’s WiFi DSL gateway. I gave him about 30 pounds of solar salt for his water softener and he helped me fold up our large patio mat. As I have written here, the solar salt is simply not effective in recharging our portable water softener. We could use it at home in our residential water softener but it is a heavy, bulky, and inexpensive commodity so it made more sense to leave it here with someone who could use it than to transport it over 2,200 miles. Jim L. suggested that I pull out by pulling forward, cutting my front tires hard to the right, and angle out between a concrete pad and the Palo Verde tree (bush) by the light pole. The Palo Verde was hanging out far enough that I decided to trim a few branches so as to avoid any possibility of scratching the passenger side of the coach. My one little repair project today was to try building a “retaining pond” on the floor of the water bay underneath the leaking fresh water tank drain. I used self-stick weather seal formed to circles, one inside the other. I had noticed that there is a small gap where the discharge pipe turns and goes through the floor. My solution was to contain the water that is seeping from the drain valve in the little retaining pond and give it a chance to flow down through the gap. We are going to pick up some inexpensive bath towels on Monday to soak up the water. 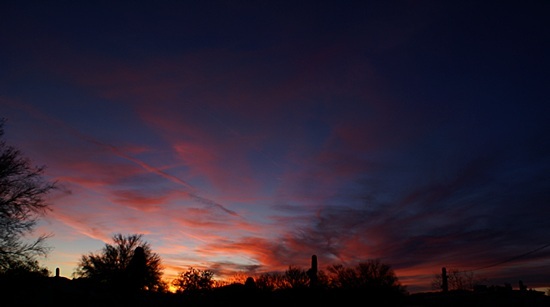 We can ring them out, line dry them in the dry Arizona air and brilliant sun, and re-use them. clean and stow the dump hoses and fittings. top up the fresh water tank. recharge the water softener (maybe). check the engine oil and top it up if needed. check the hitch, tow bar, and cables. Mid-afternoon I called J. C. and left a message. He called me back a short time later and we talked for almost two hours. J. C. was my best friend in high school (Linda had her own special status) and is one of the only people from that period in my life with whom I am still in contact. J. C. works at Boeing Aircraft as an inspector in the 737 production facility. He is only a few months younger than me but is looking at age 66 as his earliest possible retirement point. I also had a call from Pat Lintner. Pat is the National Director for our FMCA GLCC chapter and is also the Senior VP of the FMCA GLAMA. He wanted to give me a heads up that Jane Roush, the GLAMA President, would be sending an e-mail later today to all of the GLAMA chapter presidents and national directors regarding a recommendation that the Midwest and Great Lakes areas be merged. The Great Lakes Area consists of Indiana, Michigan, Ohio, and Ontario and has 21 chapters, the smallest number of any FMCAA area. The Midwest Area is made up of Illinois, Wisconsin, Iowa, Minnesota, South Dakota, North Dakota, Manitoba, and Saskatchewan and has 24 chapters. All of the other nine areas have more chapters. I did, in fact, receive Jane’s e-mail a few hours later and forwarded it to all of the GLCC members for whom I have valid e-mail addresses along with a few additional comments. The rest of the day was spent doing this and that. Linda called and brought me up to date on her day. She went with Brendan, Shawna, and Madeline to Crisler Arena at the University of Michigan Ann Arbor to watch part of a women’s gymnastics competition. Meghan and Chris met them back at the Fay-Lee house for dinner. I cleaned up the dishes, mostly silverware that had accumulated over the last few days. I checked and replied to e-mails, mostly from Gary at BCM. I worked on my consolidated blog post for the second week of January and had it ready to upload by 11 PM but was too tired to start the process at that hour. This entry was posted in Accounting, BCM, Bus Projects, Family-Friends-Home, FMCA, FTH, GLAMA, GLCC, Professional, RV-Travel, WordPress and tagged 'cold cuts' (vegan), 'Soyrizo' (vegan), Albertson's (Blythe CA), Barry's Breads (Q), body panel (H3-40), bus bays (H3-40), bus waxing (H3-40), Butch & Fonda Williams, David Lambert, Farmers Market (Q), FMCA GLAMA, fresh water leak, fresh water tank, furnace (home), Gary Hatt (BCM), Hei-Tek (Phoenix), J. C. Armbruster, Jim & Flo Liebherr, Larry & Sandy (Q), Linda, LiveStream (Technomadia), MAC solenoid air valves, morning RV routine, Pat Lintner (GLCC/GLAMA), Potassium Bromide (KBr), Roho (Brockner's dog), speedometer lighting (H3-40), Stacy (BCM), TireTraker TPMS (Daryl Lawrence), turbo boost gauge lighting (H3-40), turbo boost sensor (H3-40), UPS (Blythe CA), UPS (Q), whole house generator on 2015/02/28 by BRF. Note: There are no photos for this post. We stuck around Q today. While driving through Borrego Springs yesterday afternoon we came upon the Sea View roadside fruit stand. It was on the northeast corner of an intersection north of town surrounded by citrus and palm orchards. The stand had 5 pound bags of tangelo oranges and 10 pound bags of jumbo grapefruit for $3 per bag; self-serve. We stuffed $6 in the collection box and took one of each. We had grapefruit for breakfast this morning and several oranges throughout the day. After breakfast Linda went for a morning walk and I settled in to work at my computer on Bus Conversion Magazine articles. We had planned to drive to Sara Park in Lake Havasu City mid-afternoon for the Western Pyrotechnic Association fireworks show but decided we would go tomorrow instead. We were tired after our whirlwind 2-day visit to California and did not feel like making the 150 mile round trip. Larry and Sandy drove up to see the show on Friday evening and said it was spectacular. For dinner Linda made pan-roasted Brussels sprouts with balsamic vinegar and honey, quinoa, and mashed Romanesco brocciflower with salt and pepper. A small glass of white wine completed the meal, which we ate outside, and it was all delicious. We had just finished eating when Butch and Fonda brought their chairs and their dogs over. 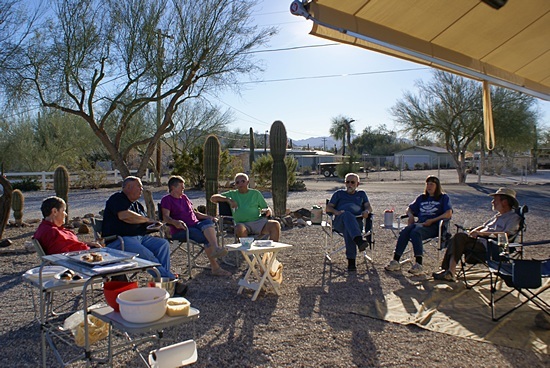 They have gotten deeply involved in the Quartzsite Road Runners Gem and Mineral Club and we have been busy with travels so we have not had as much opportunity to chat as when we first got here. We sat and talked until long after the sun set. It still cools off here when the sun goes down but not as quickly or as much as it did in December and January. With proper clothing or a light blanket we can now sit outside well into the evening. Even with the lights of the city the stars are bright and numerous. Once we came inside we did our usual evening things for a while and then went to bed. We had a quiet morning at home that included the last of our Ethiopian Yirgacheffe coffee beans and some of the grapefruit we bought on Friday. One of the couples we were visiting with on Friday, Steve and Liz Willey, started, owned, and operated Backwoods Solar in Idaho for many years. They sold the business a few years ago but they still carry copies of the Backwoods Solar Planning Guide and Catalog when they travel. Much of the information in the planning guide section was written by Steve and he gave me a copy of the 2014 edition. We had exchanged several e-mails about a solar system for our bus so he knew I was interested in the subject. I spent the entire morning reading through the Backwoods Solar book while Linda checked up on the state of the world, the weather back home, and, finding no good news, went for a walk. I checked my e-mail at 1 PM and then started getting ready to leave for Lake Havasu City at 1:30 PM. Today was the final day of the Western Pyrotechnics Association 26th annual conference which was also billed as Winterfest 2015. The gates opened at 3 PM and we wanted to be there by then so we could get a good spot for our chairs. The ground displays were set up in the infield of the small Havasu 95 Speedway. Like most race tracks it had a high, curved fence surrounding the track. We entered from the east and by bleachers that were there facing west towards the mountains and, way off in the distance, the Colorado River. To either side of the bleachers were large areas where spectators could set their own chairs. We put ours to the left up against a border fence designed to keep spectators about eight feet back from the track fence. The aerial displays were launched from beyond the other side of the track. That area sloped downhill away from track so that the firing stations were not visible. The sky was clear, the air temperature was warm but not uncomfortable, and the sun was hot. We brought a lightweight blanket to protect us from the chilly night air that would inevitably occur after sunset but we hung it on the fence as a sunscreen which kept the sun off of our legs. Although our Tilley hats could shade our heads and faces, we also had two small umbrellas that we brought just for this purpose. With all of our sun paraphernalia in place we relaxed, snoozed, and waited which was actually a very pleasant way to spend the afternoon. We eventually got hungry. Given that the venue had food vendors and bathrooms we did not have a reason not to eat. Our choices were popcorn, soft pretzels, and veggie burgers with lemonade to drink. Unlike a lot of closed venues, the food was not overpriced and all of the workers looked to be high school age. Just after 6 PM the sun slipped behind the small mountain range nearest to the track and we put our umbrellas away and took down our blanket. Although it was still daylight the crews started shooting off small aerials sporadically. By 7 PM the sun had set and there was a beautiful glow along the distant mountains. By 7:30 PM it was dark and the fireworks got started in earnest around 7:40 PM. A local radio personality served as MC. Being a Western Pyrotechnics Association event it was different from other fireworks displays we have seen over the years. Before the main (commercial) display began they shot off shells and ground displays that had been made by WPA members in workshops during the four days of the Association convention. They were shot off (or lit) one at a time and the MC announced the name of the builder and type of firework. Most of us just watch a fireworks display and say “ooh” and “ahh” at the appropriate times, and maybe clap for a particularly impressive burst. Not surprisingly, however, the things we are watching all have names. Indeed, pyrotechnics has its own specialized vocabulary but most of us are never exposed to it. It made for an interesting as well as entertaining evening. As the evening went on the air temperature cooled off and the fireworks heated up. We put on our shirt jackets and threw our blanket over our legs. The two professional displays were done by the Not Yet Ready For Prime Time Players and AM Pyrotechnics. The NYRFPTP show was all done from the infield and was very interesting. The AMP show was all large aerials that were shot one at a time. The main reason for this was so the buyers in attendance could see each shell by itself, but it had the same benefit for the other spectators and had the added benefit of extending the show without overloading the senses. When the main show was finished around 8:30 PM most of the audience left, but WPA members were instructed to come to the launch areas and finish shooting off their products. Some people sitting next to us had advised us to stick around, so we did. By 8:45 PM more fireworks were being launched and lit and that was still going on when we finally packed up at 9:30 PM and headed back to the car, which was parked right by the entrance to the track. There was a soundtrack but the fireworks were not synchronized to it. Perhaps the best part of the evening was that we were much closer to the ground displays and launch sites than is usually the case at a major Fourth of July celebration. One of the “effects” was a “wall of flame” that was set off on the far side of the track. I do not know what they used for fuel but we felt the heat where we were sitting! An interesting side note was that the larger aerial “bombs” (technically “salutes”) kept triggering car alarms. We drove home in the dark but it was not our first time driving this route and traffic was light at that hour. We got back at 11:15 PM, checked e-mail, and headed off to bed. If we are back in this area again at this time of year we would likely position our coach closer to Lake Havasu City and attend the fireworks display all four nights. As with many other things this winter it was a new and unique experience. With the Western Pyrotechnics Association fireworks display last night at Sara Park in Lake Havasu City our sightseeing and tourist activities in and around Quartzsite came to an end. Linda is flying home tomorrow for two weeks to deal with corporate accounting and both corporate and family tax returns. That meant today was spent getting her ready to leave and me ready to have her gone. After our usual coffee, juice, and granola breakfast we drove to the Albertson’s supermarket in Blythe, California to stock up on grocery items for me. We bought lettuce so I can make salads, but we bought a lot of prepared/packaged vegan foods that do not require much cooking time or technique and have minimal cleanup. While Linda has a lot to do back home I also gave an ambitious list of things I want to accomplish while she is away. I also want eat well while she is away, but I do not want to spend a lot time cooking and cleaning up. At the top of the list are six or seven small, but critical, bus projects. Right behind those is to finish cleaning and waxing the passenger side of the bus. We have acquired a certain amount of “stuff” since we got to Q and it needs to be organized and stowed for travel, after which the inside needs some deeper cleaning. After that it’s continuing to catch up on blog posts and working on drafts of articles for Bus Conversion Magazine. When we got back and had the groceries stored Linda started a load of laundry and began gathering up her stuff for the flight home tomorrow while I worked on programming our new TireTraker TT-400C monitor and re-installing all of the sensors on the tires. Our original monitor had a charging problem and Daryl Lawrence mailed a replacement to us along with a charging cable. It arrived on Friday and Butch picked it up at the Post Office and gave it to me on Saturday morning. I tried all of the possible combinations and verified that the original charging cable was fine but the original monitor was not. We will return the old monitor and cable to Daryl and Cheri at Escapade in a few weeks. The driver side front tire was giving a low pressure alarm so I checked the pressure with my digital gauge. It was 97 PSI (it is supposed to be 115 PSI). The Dewalt air-compressor was already out of the car and secured to the fence along the north property line so I plugged it in, got the air hose out, and filled the tire back up to 115 PSI. I was going to check/fill all of the driver side tires, since they were in the shade, but I really needed to do that in the morning when the temperature was near its overnight low and before the sun stared to warm up the passenger side of the bus. I may do this Wednesday, just to get them close to right, and will do it again on Monday, March 2nd so we are ready to leave on the 3rd without too much to do other than pull out and hook up. When I was done with the TPMS we trimmed our two cats’ claws, which were overdue. This has been a “mañana” task for a while but finally became a “hoy” task when we ran out of days. I called Buck Bolding to see if I could stop by his place tomorrow on the way back from dropping Linda at the Phoenix airport. Buck and his wife, Pat, were at the Eagles International Rally last month in Quartzsite with their gorgeous Eagle Bus Conversion and we discussed having me photograph it for a Bus Conversion Magazine featured bus article. Buck remembered the conversation but unfortunately this was not a good week for him for this project. He and Pat hope to make it back to Quartzsite yet this month. If so, they will probably stay at the Quail Run RV Park just north of us on Central Avenue (AZ-95) which would be very convenient for me. Linda and I sat on the north-facing porch of Joe and Connie’s park model trailer to escape the sun and enjoy the light breeze that was blowing. Barb stopped by for a while and then retired to her motorhome. Fonda came over to show us the small opal she spent part of the day grinding and polishing. She went back to her bus and Butch cane over followed by Larry and Sandy. We discussed and compared the WPA fireworks display they saw on Friday to the one we saw last night. They returned to their motorhome and Linda went over to talk to Fonda leaving Butch and me to sit on the porch and solve all of the world’s problems. While we were doing that Linda and Fonda decided we should all go out to dinner at Crazy Jerry’s. We had our usual 12″ pizza–thin crust, no cheese, with mushrooms and onions–and a side order of French fries. Our waitress was Michele and we had a nice chat with her about the restaurant and the town of Quartzsite. She and her husband own both the Main Street Eatery and Crazy Jerry’s. When we got back to our coach Linda finished gathering up her stuff. All she has to pack in the morning are her computer, power supply/charger, and iPad. We were in bed by 10 PM and set the wake-up alarms for 6 AM. We were awake before 6 AM but stayed in bed waiting for the wake-up alarms to go off. Linda set one on her iPad or phone, I’m not sure which one, but it did not go off. I set the alarm on the panel mounted click by my side of the bed and it did go off. Linda prepared herself for traveling and packed up her iPad, computer, charging cables, and other electronic paraphernalia without which modern life would be unbearable at best and impossible at worst. I did not make coffee and we did not have breakfast as the Phoenix Airport was a two hour drive with limited rest stops. We had targeted a 7 AM departure but by 6:40 AM we were ready to go. Linda’s “suitcase” was a zip top nylon bag that I got at a conference some years ago. Everything she had with her, except her down coat, fit in that bag or in her computer bag. We pulled out at 6:45 AM, made our way through town to Exit 17, and got on I-10 going east. We made good time as the speed limit on I-10 away from major cities is 75 MPH, allowing me to travel comfortably at 68 MPH. We got to watch night give way to dawn give way to the sunrise and then daylight. Once the sun was up driving was more difficult until it rose high enough in the sky that our sun visors could do their job. Traffic was light heading eastbound but there was a steady stream of trucks headed west. We made good time, even as we entered the Phoenix metropolitan area, until we were about 12 miles from the airport where traffic came to a standstill across all six lanes. The GPS indicated heavy traffic ahead and one hour to reach our destination. We had planned to drop Linda at the terminal at 9 AM, two hours before her scheduled departure, so a one hour delay would be cutting it too close. Linda grabbed the atlas (so glad we brought it along) while I moved to the right hand lane. There were major surface streets paralleling I-10 to the south so I exited the Interstate, drove down to the first one, and turned left to continue our eastward travel. It moved a long reasonably well and eventually put us on I-17 southbound, which almost immediately curved eastbound. About five miles later we intersected I-10, headed north, and took the airport exit 1/2 mile later. From that point we just followed the signs for Terminal 3 which is the one that Delta Airlines uses. As we were driving through the airport I got a phone call. I dug my phone out of its case and handed it to Linda. She said it was identified as possible spam and declined the call. She set my phone in the console between the front seats and we pulled up to the departure curb at Terminal 3. She took off the light jacket she wore in the car, grabbed her two bags and her down coat, gave me a quick kiss, and trotted off into the terminal. I pulled away and before I got to the turn-around to get back to I-10 reached for my phone only to discover it was not there. A missing phone is a sickening feeling, on a par with a missing wallet. I searched around as best I could while driving and could not locate it. I thought that Linda might have inadvertently taken it with her. If so, my hope was that she would discover the mistake when she went through security and head back to the curb to look for me, realizing that I would be looking for her. I circled through the terminal road system for 20 minutes but she never appeared. As inconvenient as it would have been for her to take it with her, she could have shipped it back to me overnight. My worst fear was that it fell out on the ground at the airport, in which case the best (?) I could hope for was that someone ran over it and rendered it unusable. I should have found one of the cell phone lots and done a more thorough search of the car, but if it wasn’t in the car there wasn’t anything I could do about short of finding a pay phone, and when/where was the last time/place you saw one of those? I circled the terminal one last time and then followed the signs for I-10 west and headed for Quartzsite. Phoenix has an extensive highway system, which always has its own complexity, but the traffic was ridiculous. We avoided Phoenix on our way to Q, using I-8 and AZ-85 to bypass the “big city.” We will be avoiding it again in a few weeks when we relocate to the Casa Grande area and then to Tucson. I remembered seeing a QT (Quik Trip) filling station and convenience mart on the west edge of town when driving in this morning. Their listed price for Regular gasoline was $2.099, cash or credit. I could have made it back to Q on the fuel in tank but why risk running out, especially given the price? I exited the Interstate, used the facilities, and bought a cup of coffee. This QT had the fanciest coffee and tea self-serve area I have ever seen. I topped off the tank with some inexpensive gasoline, cleaned the windshield, and continued on my way. I also found my phone, which had not been placed in the center console like I thought, but just in front of it, allowing it to slip down in front of my seat where I could not see it while driving. Whew. I suddenly felt a lot better. With the delay getting to the airport, the added time driving around the airport, and the stop for fuel I got back to our motorcoach around noon instead of 11 AM. Butch and Fonda were outside contemplating what appeared to be all of their worldly possessions which were arrayed on and around their patio. Butch was studying his new VDO electronic speedometer, a 437-152 just like mine. All of the printed directions referred to using a 12VDC power source but the instrument case said “12/24V”. Chuck Spera and I have both installed this exact same model gauge in our Prevost H3-40s and my recollection was that we had them wired to 24VDC ignition switched sources. Butch put in a call to VDO technical support (Continental) and I called Chuck. He did not recall even checking the voltage and just used whatever was there. I was almost certain that I had checked the voltage and it was 24VDC, which is why I wired the two 12V light bulbs in series. Butch got a call back from VDO verifying that the gauge would work on either voltage while I had a long chat with Chuck in which he brought me up-to-date on their winter at Pelican Lake Luxury Motorcoach Resort in Naples, Florida. Chuck mentioned that Prevost Community is having a “non-rally” rally April 17-20 at the Bella Terra Luxury Motorcoach Resort near Gulf Shores, Alabama. There is no rally fee and they negotiated a special group rate of $35/night. That may be a bit late in April for us to be that far south, but maybe not. We would like to be home by May 1st and we would like to visit family in St. Louis on the way. I-55 starts at I-10 just northwest of New Orleans and Bella Terra is an easy day’s drive from there. Chuck said there is an Indian Casino on Lake Charles that has an excellent RV park for $13 per night that might be a good stopping spot for just before/after the rally. He also mentioned that there is a thread on the POG forum about bus barns. I made a nice, large salad for dinner, had a small glass of wine, and turned in early. I plan to start on cleaning and waxing the passenger side of the coach in the morning. Today was my first full day without Linda here. This how it went. I set my alarm and got up at 6 AM. I made coffee and had the raspberry pastry bites for breakfast. Yeah, they’re vegan, but definitely not WFPB. I got the trash and plastic bottles ready to take out and then worked on yesterday’s blog post. It was still dark out so I spent a little time straightening up the inside of the coach. Once it was daylight I started cleaning and waxing the passenger side of the coach. I wiped the windshields off (again) and then did the side from the front corner back to the patio awning front support arm. I worked from 8:30 to 10:30 AM which was a bit too long as the sun was very bright and the body panels were getting quite warm causing the wax to dry too quickly. I put away my supplies and gathered up my microfiber towels. I had enough clothing and towels to do a load of laundry and added the microfibers to the batch. This was the first time I have used the laundry room since we arrived so Barb showed me how to set washer controls. Whenever I was not doing something else I worked at my computer. Other than a few e-mails my focus was BCM articles. In particular I am trying to finish an article on “Quartzsite 2015.” The article was basically written a couple of weeks ago, but we have done other things since then so I want to expand it a bit. What I mostly spent the day and evening working on were the photos. I got the trash and plastic bottles ready and took them to their respective containers. I let Barb know that I needed to use the car port sometime in the next 10 days. I want to wash and wax the car and will need to get it in the shade. When I was done with the laundry I finally ate the grapefruit I got out for breakfast. I was still hungry so I also had a sandwich for lunch. I checked the total hardness of the water coming out of the water softener and it was still somewhere between 3 and 7 grains per gallon, indicating that more regeneration was still needed. First I switched the hoses around and gently back-flushed the unit using filtered water. I switched it back to the regular configuration and added a 26 ounce container of non-iodized table salt. I ran the water through the unit until it was noticeably salty and then shut it off and let it sit for 20 minutes. I repeated this, letting about 10 gallons of water go through the softener each time. Late afternoon I removed the housing, rinsed out the little bit of remaining salt, reinstalled the housing, and gently ran about 15 gallons of filtered water through the unit to get the residual salinity out if it. It was dark by then so testing the TH will be a task for tomorrow. I had several text messages and calls from Linda throughout the day. One was a photo indicating evidence of mice in the pantry. Oh joy. We were gone all last winter, which was bitter cold and snowy, and did not have a problem so we do not know what is different this year. Linda though that perhaps all of the construction work (landscaping and natural gas) had disturbed the local mice. Whatever the cause there wasn’t anything I could do about it from 2,200 miles away so I made a nice green salad for dinner and then continued working on photos for my article. This entry was posted in Accounting, Arizona, Bus Projects, coffee, Professional, RV-Travel, WFPB and tagged Albertson's (Blythe CA), Backwoods Solar (Idaho), BCM, Bella Terra (Gulf Shores AL), Buck Bolding (Eagle conversion), Bus Conversion Magazine, bus waxing (H3-40), Butch & Fonda Williams, cheap gas (QT in AZ), Chuck Spera, Crazy Jerry's restaurant (Q), Delta Airlines, hard water (Q), Havasu 95 Speedway (Sara Park), I-10 (AZ), Jim & Barb Brockner, Lake Havasu City (AZ), Larry & Sandy (Q), missing cell phone, Pelican Lake Motorcoach Resort (Naples FL), Phoenix AZ traffic, Prevost Community rally, Road Runners Gem & Mineral Club (Q), roasted Brussels sprouts (WFPB), Romanesco brocciflower, Sara Park (LHC), Sea View Fruit Stand (Borrego Springs CA), Sky Harbor Intl Airport (Phoenix AZ), Steve & Liz Willey (FTH), TireTraker TPMS (Daryl Lawrence), VDO 437-152, VDO Speedometer, veggie pizza (vegan), water softener regen (H3-40), Western Pyrotechnic Assoc (WPA), WPA Winterfest 2015 (LHC) on 2015/02/18 by BRF. A panorama from the roof of our bus. Left edge is NE, center is S, right edge is NW. As forecast, we woke up to cloudy skies and milder temperatures. The clouds to the southwest looked like they might produce rain but the winds were blowing gently from the southeast so the rain would not be for us. This was the day we’ve been waiting for, the perfect kind of weather for washing a bus. But not first thing in the morning. Coffee and breakfast come first while we wait for slightly warmer temperatures. The waste water tank level sensors are not accurate but our fresh water tank sensors are OK. The fresh water level gauge was showing less than 1/3 tank and the grey water tank gauge was showing full so it was probably time to dump and fill. When I checked the fresh water level visually we were at 1/6th tank. I dumped the black water tank and then the grey water tank, both of which were fairly full, and then filled the fresh water tank. I have the city water regulated to ~50 PSI (static) which drops to ~30 PSI when the fill valve is fully opened. At that pressure it takes about 40 minutes to fill the tank. I last dumped the waste tanks on December 30th and added 25 gallons of (hard) fresh water. On December 31st I added another 30 gallons of (hard) fresh water. On January 2nd I recharged our water softener, drained about 1/6 tank (~20 gallons) of (hard) fresh water and filled the tank with 120 gallons of soft water. I checked the hardness of the water coming out of the softener after that fill and it was 1.5 grains/gallon (25 ppm). I checked it again after today’s fill and it was still 1.5 gpg. Since we are keeping a log of the dumps and fills I plan to check the hardness after each fill so can regenerate the water softener before it gets depleted and we end up with really hard water in our tank and system. Butch happened to be at the Post Office Annex today checking the P. O. Box at exactly the same moment a postal worker was about to put something in the box and then stopped because of the forwarding tag. The “something” was our package of water hardness test strips from Bristol, Indiana and the worker was kind enough to give it to Butch to give to us. He also learned that they still have P. O. Boxes available so he went to the main post office to find out more about that. He came back with a form to fill out and it had room for all of our names so the six of us are going to share the box and the cost, which is $56 for six months, or just under $20 per couple. While the fresh water tank was filling I started getting ready to clean the roof by getting out our Little Giant step/extension ladder and various cleaning supplies. The dump and fill was done by 11 AM and it was warm enough by then to start working. Swim trunks, a white T-shirt, and Kean sandals was the uniform of the day. I carried the hose sprayer up the ladder with me and then lowered it down to use as a hook and lift wash water bucket, scrub brush, and other paraphernalia up to the roof. It turned out to be sunnier than I had hoped but I worked for about four hours, not including a lunch break, and scrubbed the entire roof. I used McGuire’s red automotive soap and rinsed thoroughly. I had already washed the roof once using Dawn dish soap (a big ‘no no’, apparently) and a long-handle soft brush. That washing had removed surface dirt and revealed the full extent of the dark “spotting” that gave the entire roof a mottled appearance. The roof looked a lot better after I scrubbed it but a lot of the spotting remained. We are anxious to clean the sides of the bus but there is no point doing that until we are done with the roof. 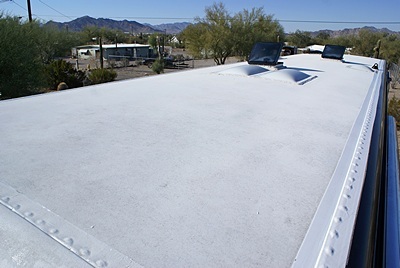 We want the roof “like new” clean so dirt doesn’t run off it onto the sides, but we also want it clean because we are seriously considering having Discount Solar (here in Quartzsite) install solar panels and a charge controller and do all the wiring. As long as we had the hose, brushes, and soap out we decided to wash the car. It was even filthier than the bus, if that’s possible, and it was nice to finally have it clean. After cleaning up our equipment I got cleaned up and then sat and visited with Butch for a while. Linda came over and announced that she wanted me to take her to dinner. Butch and Fonda decided to go too so we went to Crazy Jerry’s, which is not to be confused with Silly Al’s. Silly Al’s is supposedly the #1 eatery in Q, at least for pizza, but they have karaoke every night starting at 7 PM. Thank you, no. Crazy Jerry’s also has pizza and we tried the vegetarian, hold the cheese. Very thin crust (the way we like it) and lots of topping. A couple of side salads and a side order of French fries. FWIW, we did not eat the entire pizza and brought home the leftovers. Linda split a pair of Scrabble games with her brother, the first one he has won in quite some time. She had an e-mail reply from Mara. She is camped about 70 miles south of Q and is headed here in the near future and is going to camp with the WINs (Wandering Individuals Network). I checked e-mail, updated my BCM article spreadsheet with two more story ideas, played a few games, and worked on this post before turning in for the night. We will have been here a month as of Sunday. I left the ladder setup yesterday so I could check the roof again this morning and determine what additional cleaning measures, if any, I might want to take. I also wanted to get back up on the roof and measure the space we have available for solar panels. I was expecting two packages via UPS; one from B&H Photo (Manfrotto nodal panoramic tripod head) and one from Sure Marine Service (Webasto repair parts). I had a nice view of the mountains surrounding Quartzsite from the roof of our bus and wanted to shoot some panoramas with the new head when it arrived. Butch, Fonda, Jim, Barb, Linda, and I all went to the U. S. Post Office in Quartzsite this morning to sign up for our very own P. O. Box which means we finally have a way to receive USPS mail while we are here. Just in time, too, as Q has really filled up in the past week and there is more to come. I have an FMCA national education committee meeting on Monday and need to write a few items for a member survey and review other materials. Gary (from BCM) is also due to arrive on Monday, and both Curtis (from RVillage) and Mara Culp (HFH build acquaintance) may be headed this way as well. I believe Chris Dunphy and Cherie Ve Ard of Technomadia are already in the area. The big RV tent is up and those vendors are arriving and setting up. Once we were done at the post office I went to Discount Solar to discuss a possible installation on our coach. The Kyocera panels are 26.5″ W x 59.0″ L. They are “12 V panels” but are rated at 140 Watts putting out 7.9 Amps. They cost $350 each. Those numbers compute to an output voltage of 17.5 VDC and $2.50/W. (If a 140 Watt panel was operating at 13.8 Volts it would produce just over 10 Amps.) Because we have a 24V battery system we would need to install the panels in series-connected pairs. The preferred installation for the rectangular panels is to have the long dimension lined up fore-n-aft to either side of the centerline of the roof. Tilt mounts are available ($45/panel) but we would probably not install them due to the difficulty of getting onto our roof to use them. “12 volt” batteries typically charge at around 13.8 to 14.1 volts. Our “24V” system charges at 27.6 to 28.2 volts and a series-connected pair of panels produces 7.9 A at 35V (full sun) for 276.5 volt-amps, which is essentially “watts.” Two pairs would produce 15.8 A (553 V-A), and three pairs would produce 23.7 A (829.5 V-A). The higher voltage output of the panels is reduced and regulated by a solar charge controller before getting to the batteries. Discount Solar carries Blue Sky and Trimetric maximum power point tracking (MPPT) controllers and the Blue Sky Solar Boost 50 would handle three series-connected pairs for about $550. The MPPT controllers are DC-to-DC converters so they convert the excess voltage into additional current. With full sun this six panel system could supply up to 30 A of charging current at the proper voltage, which is why we would need an MPPT controller that can handle more than 30 A of charging current. We would also want room for expansion or replacement with higher wattage panels if they were available at some point in the future. One of the nice things about the solar system is that it would always be on and would “play nice” with our other charging systems. Another nice feature is that they are silent when operating. Ahhhh. Because of the size of our house battery bank (400 A-Hr at 24 VDC) and the fact that we have a residential refrigerator, auxiliary air-compressor, and other AC loads, we would need/want at least six panels. (I have not included the four Group 31 wet cell batteries that are used to start the engine and power the chassis as part of the solar system.) If the batteries were discharged 50% (200A-Hr) it appears that it would take just under seven hours to bring them back to full charge based on the 30A charging current. In actuality it would take longer in a boondocking situation as the sky is not always clear, the sun is rarely directly overhead (perpendicular to the panels), there would be devices using some of the energy, and the amount of current the batteries can accept falls off as they get closer to being fully charged. Installation is $90/hour plus mounts ($15/panel), wire, connecting blocks, and other parts, and would take 4 – 5 hours to complete. The owner assured me they would have it in and out in one day so we could be back in our parking spot before dark. The last three weeks of January are the busiest time of year for Discount Solar and since we are plugged-in to shorepower we do not need the solar system right away. If we have it installed in early February we would have a month to make sure it works and resolve any problems. The system would cost about $3,300 installed. We have at least a month to think about it. When I returned to our coach Linda was out walking. When she got back I went up on the roof with a tape measure to see if/how the solar panels might fit. With a four-n-aft orientation we could put two towards the front outside edges, one just aft of the kitchen skylights on the driver side, and one aft of the hall skylight on the passenger side. We could put two more somewhere in the rear. The options for the rear appeared to be inline (almost touching) on the driver side starting just behind the bathroom skylight or putting one there and the other one sideways across the back just ahead of the dropped portion of the roof and aft of the bedroom vent fan. Placing the panels in these locations would leave the center of the roof open so I could climb up on the driver side front and walk all the way to the back. Barb stopped by to let us know there was a mattress in the house (park model trailer) if we wanted to try it out. It had been in their rig for about two years until they removed it yesterday and replaced it with a thicker one they got from Connie. It is a regular queen size mattress about 6″ thick, so not one of the oversized behemoths that have become the norm. They also had a 1.5″ thick memory foam pad to go on top of it. We took a look at it and decided to give it a try. We have been using our old Select Comfort adjustable air mattress in the RV since summer 2013. One side (mine) has a slow leak so I have to adjust it every other night. I could live with that indefinitely but what we really dislike about it, and have for a long time, is that we tend to roll into the center or off the edge. It also takes up valuable storage space under the bed for the pump, has wires and hoses to deal with, and has a controller for each side. We were definitely ready to try something else so we stripped the bed, disconnected the two air hoses, and carried the mattress out of the bus. It was surprisingly heavy and bulky for an air mattress and lacking in self-supporting structure, but that also made it easier to bend it around the front passenger seat, down the entry stairs, and out the door. We stored it in the bedroom of the house trailer pending a final decision about the replacement mattress. We carried the new mattress in, which was definitely easier than getting the old one out, and got it positioned on the plywood bed platform. We put the memory foam pad on top and put our mattress topper over that which added another inch. We put our electric heating pad on and then the sheets and the blanket. We will try it out for a while and if we like it we will see if the Salvation Army wants the old one. If not, it may end up at the Quartzsite dump as we really do not have any way to get it home or a reason to do so. We will leave the pump, hoses, and controllers under the bed until we decide on its final disposition. The suspension on the bus had settled slightly in the driver side rear since we parked and leveled it almost a month ago. It would not have been enough to require an adjustment except that our bed sits crosswise with the head on that side and I find that sleeping with my head even slightly downhill is not comfortable. Rather than start up the main engine we got the Dewalt portable air-compressor out of the car and connected it into the brake system fill port in the passenger side engine bay. I had to connect the chassis batteries and turn the ignition on (without starting the engine) in order to activate the leveling controls, but that allowed me to raise that corner up and get the coach level side-to-side. At some point we will re-position the bus, but not until I have completed some work on the turbo boost sensor mounting plate and hose and the level low system components for the front end. We put the air-compressor back in its special storage divider in the car and decided to rearrange a few things so we could put the rear seat down. Starting next week we will need to be able to carry a passenger. We thought about heading down to the market area but remembered that we were expecting UPS deliveries. I started working on two more articles for BCM instead while Linda went for a walk. It was warmer today and so it was warmer in the coach and I ended up taking a nap. Our UPS and FedEx shipments usually arrive late in the afternoon or early evening but had not shown up by dinner time. I had planned to disassemble the Aqua-Hot burner and replace the bearings, nozzle, and perhaps a few other small parts tomorrow but it now appears that will have to wait until Tuesday, assuming our shipments arrive on Monday. I will likely need to clean the unit as well, given that it has been running so rich, and that may include pulling the combustion chamber. Linda made two cold salads for dinner; chickpea and wild rice Waldorf. Both are favorites of ours, especially in warmer weather. We had some Barry’s Basic Bread with our meal and another glass of Lamb’s Valley organic sweet white wine was a most agreeable accompaniment. Yup, that’s a real, live camel in the Hi Jolly Daze Parade. These animals are strongly linked to the 19th century history of Quartzsite, AZ. Today was the annual Hi Jolly Daze Parade. 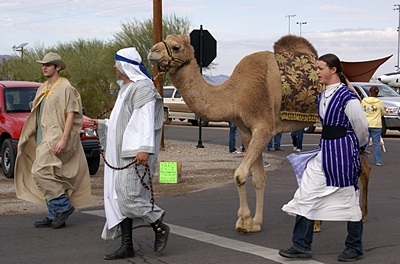 As first time winter visitors to Quartzsite there was no way we were going to miss this event. I was up at 7 AM to make coffee and we were done with breakfast by 8 AM. We checked the parade route online and figured we would go to the Quartzsite Improvement Association grounds as the parade ended in the parking lot there. It was scheduled to start at 10 AM so we snagged Fonda about 9:40 and headed that way in the car. When we got to Central Avenue and Main Street the police had Main Street closed so we could not turn left to get to the QIA. I stayed on Central down to Kuehn Street and took it east over to the exit 19 overpass and back to Main Street. On the way we saw Lloyd DeGerald’s motorhome parked along Kuehn with a big banner advertising his Aqua-Hot technician services. I am hopeful that I will be able to repair both of our burners myself but if not Lloyd is the guy I would call, so I was glad to see that he is in town. But back to the parade. The police had Main Street closed on that end too. We knew the parade started at Plymouth Avenue and Quail Trail so we headed in that direction and parked at the Quartzsite Library. We were surprised that no one else was parked there as it was a short walk from there to the start of the parade route which turned out to be an excellent spot from which to view the parade. What we realized after we got there was that the west side of Plymouth Avenue was lined with cars from the starting point all the way to Main Street. I suspect that Main Street was similarly lined with people, most likely in cars, but we were not able to observe that directly. We had a few drops of rain leading up to the start of the parade. There were plenty of grey clouds around, but the sun was also shining and the parade did not get rained out. 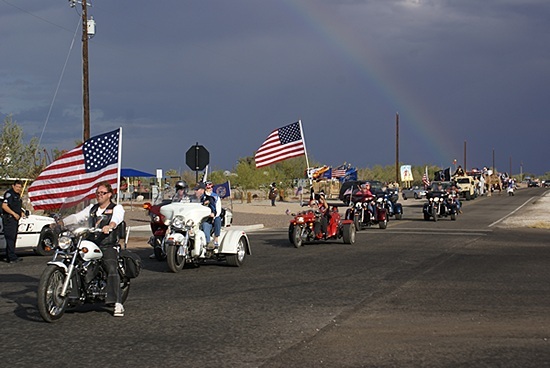 In fact, a full 160 degree rainbow formed behind the parade and lingered until most of the participants had passed us. The highlight of the parade was a live camel. The experiment did not work out as the Army’s horses, mules, and burrows were apparently terrified of the giant animals and would panic in their presence, but Hadji Ali remained in the U. S. and eventually ended up in Quartzsite where he died in 1902 and was buried in the local cemetery. We got the impression that he was something of a living legend in his own time and in the 1930’s the governor of Arizona had a monument erected at Hi Jolly’s gravesite. It is a small pyramid made of local stone with a metal plaque on one side and a metal profile of a camel on top. According to Wikipedia the monument is allegedly the most visited location in Q. When the parade was over we returned to our coaches. Linda went for a walk and I wrote another article for Bus Conversion Magazine. This was another short one, less than two pages and only 11 photos, on the installation of the new speedometer in our bus. When Linda returned from her walk she made a broccoli-potato mash. In addition to the broccoli and the potato it had soy milk, vegan butter, salt, and pepper. The potatoes were not completely mashed and the dish was both tasty and had a nice mouth feel. After lunch Linda made a shopping list. We headed to the Kuehn Street market area and stopped at Barry’s Breads but our timing was bad, again. We drove south on Central and found the entrance to the parking lot for “the big tent.” This is where the RV vendors will be in another week or so, but nothing was open yet, so we went over to the Tyson Wells area west of Central Avenue and found some miscellaneous items and a pair of Crocs for me. For all the shoes I brought I did not have something that was easy on, easy off. We are parked on gravel and I needed something I could slip on quickly and easily to step outside the coach. Most of Linda’s list was groceries so we drove to Blythe, California to do our shopping. To vary our trip and see some new sights we stayed on Kuehn Street heading west past the edge of town where it became West Dome Rock Road. The road parallels I-10 on the south side for a long way through BLM land and eventually ends at an interchange with the Interstate. We saw lots of RVs, and a few tents, spread out on either side of the road, but not nearly as many as we thought we would. There are probably a lot more RVs here than we realize, but the desert is a vast place. When we got to Blythe we took a few minutes to drive through town and get a feel for the place. It had a more developed, modern, and prosperous business district than Quartzsite and more houses, as opposed to park model trailers and mobile homes. The houses were not fancy but they were in decent condition. Schools and municipal buildings were also nice, and there is nothing in Q to compare to the two supermarkets and name brand stores like Auto Zone, NAPA Auto Parts, and K-Mart. We started at Albertson’s and got most of the items on our list. We then went across the street to Smart and Final Express and picked up a few things there. Once again we were not able to find the Silk brand Soy Coffee Creamer, which has us wondering if we last bought it at Wal-Mart in Parker. When we got back to camp I unloaded the car and Linda put the food away. I wandered over to say high to Butch and Fonda and play with their dogs, Daffy and Rascal, for a few minutes. I then went over to say high to Jim and Barb’s dog, Roho, which brought them out of their motorhome and got me invited in. Linda eventually wandered over looking for me and the four of us had a nice chat. It was the first time since they got here that I had been inside their rig, a Country Coach Intrigue, and it was very nice. It has one slide on the front half of the driver’s side, and there is no doubt that it really opens up the interior. Before we bought our bus we were looking seriously at Country Coach motorhomes (but not their Prevost bus conversions) and the Tiffin Allegro Bus (which is a purpose-built motorhome, not a true bus). But in the end we were bitten by bus fever and we still have it. We stopped to visit briefly with Butch and Fonda on the way back to our rig. Butch has always had an interest in metal detecting and has developed an interest in rocks since arriving in Quartzsite. If you had the slightest inclination towards rocks, gems, and minerals then being in Quartzsite during the winter would likely push you over the edge into a full-blown hobbyist. Sometime in the last couple of days Butch bought a used contraption that consists of a table saw, two grinding wheels with a water delivery system, and an electric motor. He and Fonda acquired a bucket of rocks, including a piece of petrified wood, and they are setting up an area outside their bus to work on their new hobby. For dinner Linda made pan-grilled tofu slices with caramelized onions and bar-b-cue sauce, but with a twist. Instead of hamburger buns or slices of bread she heated 12″ tortillas and made wraps. Of the various ways she has served this simple, but delicious, dish this was definitely my favorite so far. As much as I like a nice, fresh bun the tortilla wrap kept all of the ingredients contained so that I got onion and BBQ sauce with each bite, and they did not end up all over my plate and all over me. As we do most evenings, we relaxed, played games, worked puzzles, read, and wrote. We are always a bit surprised at how tired we are after dinner, but we are up and about during the day and the fresh air and sunshine just seem to wear us out. The roof of our bus after cleaning looking SW as viewed from the driver side front corner. Quartzsite, AZ. I turned the lights off last night at 11 AM and was up at 7 AM this morning which seems to have become my current routine. Because of the new (to us) mattress I was able to get up without waking Linda up. I turned up the heat in the front of the coach but not the back as Linda does not sleep well in a warm room. I started getting the coffee ready but did not grind the beans because of the noise it makes. I worked at my computer on organizational tasks such as copying files to the NAS, copying blog posts from e-mail to Word, and backing up website and photo files to the NAS. Linda got up around 8:30 AM and set the microwave convection oven to preheat in convection only mode. When it was ready she heated up the leftover cinnamon raisin rolls she took out of the freezer yesterday and put in the refrigerator. While the rolls were heating I finished making the coffee. Although they are not gigantic, one of these rolls would probably be plenty of calories for breakfast. Two rolls, however, made for a very satisfying meal. Still, they take about four hours to make fresh and about 25 minutes to reheat. She makes a batch of eight, so if we each had one for breakfast her efforts would cover four meals instead of two. Today was another bus cleaning day, but first Linda went for her morning walk while I continued to organize photo files on our network attached storage device. It was forecast to be a cloudy but mild day and by late morning the clouds had moved in, so when Linda got back we got busy. Even with the cloud cover it was warm enough that I was able to wear my swimsuit and a T-shirt, my preferred outfit for working with water. We bought some CLR Mold & Mildew remover yesterday and I tried using it on the lower rear roof. It did not appear to have any effect so I abandoned any further roof cleaning and we got started on the sides. The upper sides of our bus are not easy to clean. Even with our Little Giant extension/step ladder set up as a step ladder at its maximum height I cannot quite reach the top curve of the side walls. Knowing that was the case I cleaned all the way around the edge of the roof, where it meets the side walls and the front and rear caps, from the roof. Once I was done with that we took the Little Giant extension/step ladder and converted it from extension configuration to step ladder configuration. We worked all afternoon until after 5 PM and managed to clean the front and the passenger side. We wanted to get the passenger side done because it faces south and we wanted to do this on a cloudy day. Working a section at a time we used McGuire’s red automotive soap, scrubbed with an automotive microfiber sponge, rinsed thoroughly (with Q’s incredibly hard water), and dried with microfiber clothes. We could not get all of the hard water stains off but it was a lot cleaner, and looked a lot better, than when we started. The weather forecast for tonight was for heavy rain sometime between 9 and 11 PM with accumulations of up to 1/2″. For a place that typically only gets 4″ of rain a year that would be a lot of rain for one storm. We put our lawn chairs, mats, and other outdoor items in the carport for the night just to be safe. Shortly after 6 PM we had our first sprinkles. For dinner we had chickpea salad and wild rice vegan Waldorf salad with strawberries and peach slices and some Barry’s Basic Bread with a small glass of Franzia Fruity Red Sangria. I responded to some e-mails after dinner and deferred work on possible survey questions for the FMCA national education committee until tomorrow. 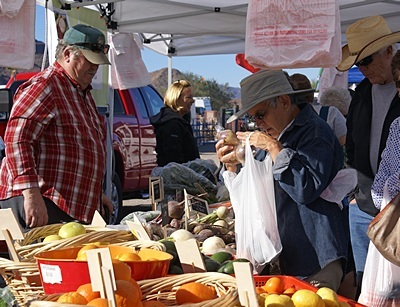 Linda makes her selections at the Quartzsite Farmers Market. It has stayed warm enough the last few nights that I have not needed the electric heating pad and we have been able to leave windows slightly open. We both sleep better in a cool room with fresh air. The deluge of rain that was forecast for last night did not develop but it was still mostly cloudy when we got up this morning. After breakfast, coffee, morning puzzles, and checking in with the world we got on with our chores. My major tasks for the day revolved around preparations for, and participation in, a 2 PM FMCA National Education Committee work session. While I worked on that stuff Linda went for her morning walk, made an appointment to get her hair cut tomorrow, and made garlic naan (Indian bread) from scratch. When the phone meeting was over I transferred photographs from my camera to my computer and then joined Linda over at Butch and Fonda’s coach for a late afternoon visit. Jim L. showed up while we were chatting, read the electric sub-meters, and figured out our bills. Linda had to write four separate checks to cover our site fee, electricity usage, laundry, and the rental for the apartment, which Jim gave to Barb to cover the cleaning before and after Marilyn’s upcoming visit. Butch placed an order with PartDeal.com for a VDO speedometer so I had him order a VDO Cockpit Series 0-30 PSI Boost Gauge for me. The UPS truck also showed up and had the two packages I have been waiting for. All too soon the sun dropped below the western mountains and it turned chilly so we retreated to our coach. Linda made curried red lentils for dinner and served it along with the garlic naan bread she made earlier in the day. Warmed and energized by this fabulous meal I launched into my second major task of the day; the creation of an e-mail group in Microsoft Outlook for our FMCA Great Lakes Converted Coaches chapter. I got the latest roster from Linda, who is the treasurer, and was able to rearrange it, save it as a CSV file, import it into Outlook, and map it to the standard contact fields. It was then easy to create a Contact Group and select all of my new entries to go in it. Once I got the group set up I wrote an e-mail to the members, my first since being elected President of the chapter back in October. I was up much later than usual, but I got it done. Escapees RV Club happy hour SE of Q in one of the BLM STVAs. Today was a day for Geeks and geekiness. Chris and Jim Guld, AKA The Geeks On Tour, arrived in Quartzsite yesterday and are staying at an RV Park not far from our encampment. Butch knew they were headed this way and after he and I were unable to get EchoLink working on his computer yesterday he contacted Jim to see if he would be willing to stop by and take a look. Jim is a former network administrator and knows a lot more about stuff like networking, protocols, ports, port forwarding, and proxy servers than we do. But before he came over Linda and I had breakfast after which she walked over to the beauty parlor and got her hair cut while I worked on a seminar classification task for the FMCA National Education a Committee. Jim G. arrived on his bicycle around 10:30 AM and stayed for a couple of hours. He re-checked the things Butch and I had already tried and tried some things we had not, but we could not get Butch’s system to let the EchoLink program connect successfully to the EchoLink servers. For the record, Butch’s system consists of a Windows Vista laptop that connects to the Internet one of two ways: 1) through a Verizon MiFi or, 2) through a WiFiRanger Go2 into a WiFiRanger Mobile into a DSL WiFi gateway of unknown make and model. Jim also tried connecting through the WiFi hotspot on his Android-based smartphone. Same result. Mixed in with work we had a great visit with Jim and hope to meet up with he and Chris at least once while they are in Q. After Jim left Linda and I were headed in to have a bite of lunch when an unfamiliar car pulled into the lot. Barb was by the road and pointed the driver in our direction. We quickly realized that it was Mara. She had called Linda first but Linda did not hear the phone ring so it was a wonderful surprise when she showed up. We visited for a couple of hours while we snacked on hummus, pretzels, and red grapes. Mara is camped on BLM land north of town with the WINs (Wandering Individuals Network) and has been traveling off and on with groups of WINs since we last saw her in Gillette, Wyoming in July 2013. Since that time she has also gotten a different motorhome, a 35′ Fleetwood Bounder, with which she is very pleased. She invited us to join a group of WINs on Sunday to go to The Desert Bar and I think we will. Linda checked it out online and it is a completely solar-powered, off-the-grid, place. You have to take dirt roads or ATVs to get there. It appears that things are finally going to get busy for us. Gary, from BCM, is supposed to arrive tomorrow and Curtis, from RVillage, is supposed to arrive on Saturday. Forrest and Mary are already here as are Chris and Cherie of Technomadia. The Escapees RV Club has happy hours scheduled tomorrow and Thursday at one of the BLM areas east of town. 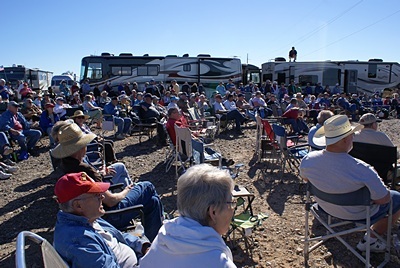 Blythe, California has a bluegrass festival starting Friday and running through Sunday. We will probably go on Friday as there is also a Balloon Festival in Lake Havasu the same three days which we will probably attend on Saturday. Somewhere in there I need to repair our Aqua-Hot and I am thinking that it will probably be Thursday. The “Big Tent” Sports, Vacation, and RV Show starts on Saturday (17th) and runs through the Sunday the 25th. Marilyn arrives on the Thursday the 22nd and leaves on the Thursday the 29th. The last full week of January really is the peak of the winter season in Q. After Mara left I used my macro lens to photograph the front and back of both of our amateur radio operator licenses. I post-processed the images to improve the readability and reduce the file size. Once I had the photos ready I downloaded and installed the EchoLink software on my Asus laptop. I went through the initial configuration for my license and tried the server connection test. As with Butch’s installation, two of the four UDP port tests failed. I ignored that for the moment and went ahead with the validation procedure for my ham license. Anyone can download and install the EchoLink software but only licensed hams can legally use it. That is because it can, and often does, connect a computer to a ham radio repeater that is “on the air” and only licensed hams are allowed to transmit on those frequencies. Validation was a multi-step process. When first starting EchoLink I had to supply my FCC callsign, name, and (base station) location. That information was transmitted to a database on the EchoLink servers but the EchoLink organization needed to validate that I was actually the person to whom that callsign was issued. Through a separate process on the EchoLink.org website I had to upload JPEG image files of the front and back of my wallet license. Once someone examined the images and made sure the call was active in the FCC database they “flipped the switch” on the server side and I was finally able to connect to stations if I wanted to. I repeated the process later for Linda’s license. While I was waiting to have my license validated I started trying to figure out how to get the EchoLink program to connect successfully to the EchoLink servers. When the communications test with the servers runs it identifies the IP address assigned to the computer. I went into the WiFiRanger Mobile and enabled UDB port forwarding for ports 5198 and 5199. The TCP test was successful so I did not set up TCP port forwarding for port 5200. Enabling port forwarding, however, was necessary but not sufficient. What I ended up doing was switching the operating mode on the ESET Smart Security program from “Automatic” to “Interactive.” With that change, the program would pop up a message box every time another program had outbound or inbound traffic through a port and ask if I wanted to allow the communication and optionally create a rule for it. Several of those messages had to do with EchoLink and after clicking “Allow” to all of them the server/router tests were finally all successful and the program was fully functional except for the license validation. Sometime in the late afternoon another motorhome showed up and backed in to the property with Jim L.’s help. It was Larry and Sandy, who normally stay at Jim L.’s RV Park near the QIA. Jim’s park is full so he put them over here in the spot by the laundry where Jack and Maria parked for a couple of nights a week or so ago. We had leftover red lentil potato curry (thick soup) for dinner with the rest of the garlic naan and a glass of sangria and it was very good, again. I finished up my FMCA education committee task and e-mailed it off. I received an e-mail that my ham license had been validated so we played with the EchoLink program and User’s Guide for a while but did not try to connect to any stations. While I was working on all of this I noticed that nine updates were pending for Windows 8.1 and there were four optional ones as well. Installing updates is often an iterative process and so it was again this evening. One of the optional updates was a roll up from November 2014 that was 723.9 MB. That’s a big update. I started downloading it at 23:52 MST and then went to bed. My hope was that fewer people would be trying to use the local DSL system to get online at that hour and the update might actually load and install successfully. But I would have to wait until tomorrow morning to find out. 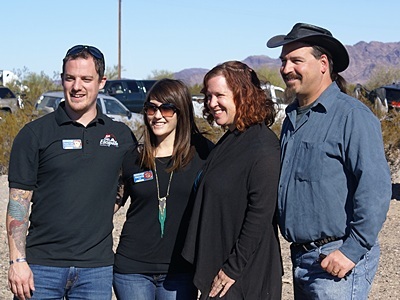 L-to-R: Travis & Melanie Carr from the Escapees RV Club and Cherie Ve Ard & Chris Dunphy of Technomadia. As soon as I got up this morning I checked the huge Windows 8.1 optional rollup update that I started last night. It had completed successfully except for restarting the computer, so that’s what I did. While the update finished installing I made coffee and got the juice ready and Linda prepared our cereal. Once the update finished I checked e-mail and websites. Linda made white bean hummus to take to the SKP Happy Hour later today. She then remembered that the Farmers Market at Desert Gardens was this morning from 8 AM to noon so we drove over there. There was only one stand selling produce, but they were from Blythe, California only (20 miles away) so the produce was very local and very fresh. Linda bought an assortment of veggies and a grapefruit. We had parked at the south end of the western parking area and from there we could see a road going back towards “Q” Mountain and a well-defined trail going up the western side. We drove back there and determined that we could park there when we decide to climb the mountain and do some panoramic photography. We drove to Barry’s Breads and bought a loaf of Barry’s Basic Bread and then continued east on Kuehn Street to confirm Lloyd DeGerald’s location. We took Riggles Avenue back over I-10 to Main Street and headed back towards Central Avenue, stopping at the Road Runner Market for a few things. When we got back Jim and Barb were aggressively trimming the Palo Verde trees in the cactus garden. As we often do most mornings, Linda went for a walk and I worked at my computer, installing three more optional updates and taking care of some e-mail. We gathered up chairs, food, and beverages at 12:45 PM and drove over to the SKP Happy Hour on East Dome Rock Road. There was already quite a crowd when we arrived and everyone was in a good mood. And why not. The sun was shining, the air temperature was pleasant, there were tables arrayed with food, people had beverages of their choice, Johnny Cockrum was performing, and lots of folks were meeting old and new friends. We had a thoroughly pleasant time, but we always do when we are with groups of Escapees. On the way back to camp we spotted Lloyd DeGerald and his wife out walking their dog and stopped briefly to chat about our Aqua-Hot. We then stopped at the trailer for the Two Crazy Ladies and ordered engraved hang tags with our call signs and a sign asking emergency responders to rescue our cats. When we got back to camp Linda went for another (short) walk and I sat down to work at my computer. We lost our Internet connection while we were away and the DSL gateway would not re-associate with our WiFiRanger Mobile so I had Barb open the house and I power cycled the gateway. I was then able reestablish the connection to our WFR-M. That is the second time this has happened since we arrived here but so far has not caused us any real difficulty. Butch has been having problems with their Progressive Industries EMS cutting off their shorepower due to high voltage. We noticed during dinner that our PI-EMS was also showing a PE-3 (previous error – high voltage). I do not know if our Magnum inverter switches on “instantly” when outside power is lost or if there is a delay but I am now wondering if we lost our Internet connection due to loss of power to the WiFi Ranger Mobile after which it was not able to reconnect with the gateway. The next time this happens I may try powering the WFR-M off for 60 seconds and restarting it. It’s also possible that the high voltage is wreaking havoc on the DSL gateway. After dinner I sent a TXT message to Gary at BCM inquiring if he had arrived in Q as planned. He called back and said they had just cleared Indio, California. I suggested they find someplace to stop and rest and finish the trip tomorrow morning in the daylight. They are headed to the Quartzsite Market Place dry camp area for the Eagles International bus gathering. I spent the rest of the evening working on five different articles for Bus Conversion Magazine before finally turning in around midnight. This entry was posted in Arizona, BCM, California, coffee, FMCA, GLCC, RV-Travel, SKP, WFPB, Wine and tagged 12VDC house system, 24VDC battery bank, air suspension (H3-40), Albertson's (Blythe CA), Aqua-Hot parts, AZ), B&H Photo (NYC), Barry's Breads (Q), BBQ sliced tofu with onions, BCM, Blythe (CA), BM (Q), broccoli-potato mash (WFPB), Bus Conversion Magazine, bus washing (H3-40), Butch & Fonda, Chris & Cherie (Technomadia), cinnamon rolls (vegan), computer ports (TCP/UDP), Crazy Jerry's (Q), curried red lentils (WFPB), Curtis Coleman (RVillage), Discount Solar (Q), Echolink (ham radio), EMS-50 (PI), Escapees RV Club (SKPs), ESET Smart Security (laptops), FCC ARO (ham radio) license, Fedex (Q), FMCA GLCC Ch, FMCA national education committee, Fruity Red Sangria (Franzia), garlic naan (vegan), Gary Hatt (BCM), happy hour (SKPs), hard water (Q), Hi Jolly (Hadji Ali), Hi Jolly Daze Parade (Q), high voltage (Q), Jim & Barb Brockner, Jim & Chris Guld (Geeks On Tour), Larry & Sandy (Q), Level Low (H3-40), Lloyd DeGerald (Aqua-Hot), Manfrotto nodal point pan head, Mara Culp, McGuire's 'red' auto soap, MS Outlook filters & rules, P. O. Box (Q), Palo Verde "tree" (Q), port forwarding, Quartzsite (AZ), Rascal & Daffy (Butch & Fonda), Roho (Brockner's dog), RV mattress, RV solar system, Silly Al's (Q), Smart & Final Extra (Blythe CA), The Desert Bar (Parker, U. S. Post Office (Q), UPS (Q), VDO turbo boost gauge, vegan chickpea salad, Verizon Mi-Fi, W Dome Rock Rd (Q), Wandering Individuals Network (WINs), water management, WFPB, white bean hummus (vegan), Wi-Fi, WiFi DSL gateway, WiFi Ranger Mobile & Go2, wild rice "Waldorf" salad (WFPB), Windows 8.1 updates on 2015/01/14 by BRF.